Bryon Maddas submitted the following. Never in my one year of performing with a drum corps could I have imagined myself participating in one ever again. I was a member of Crossmen's front ensemble in 1994. I wanted to come back for my age-out year in 1996, once again with Crossmen. Unfortunately, like a lot of other broke college students, I could not afford to do it. So I figured that I had seen the end of my drum corps career other than being a spectator or a television viewer. That changed in the summer of 1997. I read on the Crossmen Web site that the corps was looking for an administrative assistant as soon as possible since the Drum Corps International tour had already started. I responded and got an e-mail the next day from Brian Walsh, telling me to get to the bus station the next day. There would be a ticket waiting for me to go to Kingston, N.Y. to meet the corps. I got to Kingston and was told someone was going to be at the bus station to pick me up. No one was there. I tried to call Brian and got no answer. I didn't know what to do. Lucky for me, the bus station was right across the street from the Kingston stadium. So I walked over there to at least check out who was rehearsing. Much to my surprise, Crossmen were rehearsing in the stadium. This wasn't a bad way to meet up with the group with whom I was supposed to spend the rest of the summer. Brian got me situated, made room for me on the staff bus, and found a spot for my luggage. He explained what I would be doing as an administrative assistant. In other words, I would be a "gopher." Go for this, go for that. My duties changed a few weeks later. I was to drive the tour director for the rest of tour. In just a few short weeks, I had learned much from this man as to how a top-12 corps worked from behind the scenes. So, in the summers of 1998 and 1999, I decided to come back and be his driver for the entire tour. Just when I thought I couldn't learn anything more from him, I learned quickly what to do when a bus loses its drive shaft right after we leave a show and still had an eight-hour trip ahead of us. I learned what to do when the police were flashing their lights behind me at 3 a.m. when I was lost looking for the housing site. I learned what to do when one of the members suddenly got ill as I was driving down the highway and I needed to determine what the best course of action would be for the rest of the corps. I learned all this from one man. Unfortunately, 1999 was the last summer I could commit full-time to the corps. Job commitments made it impossible to take any time off during the summer. But as I made it back to a show in 2003 in Fairfield, Ohio, much to my surprise, I saw the man from whom I learned so much at the Crossmen, walking out with another corps, the Glassmen. Seeing this man made me realize how much I missed driving for a corps. As I made time to go on tour in the summer of 2005, he asked me this time if I would be willing to drive one of the member buses. Without a second thought, I took him up on the offer, met the Glassmen in Indiana and spent 10 days with them, leaving in Toledo as the corps had several days off. I did the same in 2006. 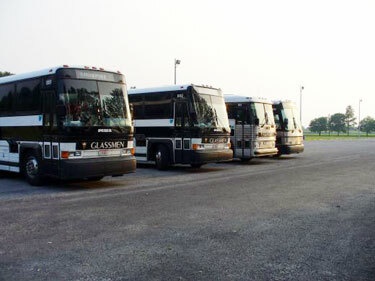 Now in 2007 — two months before the first drum corps show – I have decided to commit to a full summer as a bus driver for the Glassmen. It will be a great summer for me personally. I get to spend the whole summer watching great musicians perform night after night. I get to see God-knows-how-many-cities (mostly at night). I get to drive with a gentleman who was a fellow driver with me when I was with the Crossmen (glad to be driving with you again, Bob). And I get to spend the summer with the man who has taught me so much about what it takes to help get a corps down the road for the summer. Thank you, Rod Owens. Some may ask why I like being a driver. I really don't know if I have a simple answer for that question. I do like driving. I like the camaraderie with my fellow drivers. It is an honor to drive these talented musicians and performers night after night. And it makes me feel good inside that a great corps director like Brian Hickman—and the rest of the Glassmen staff—makes me feel like a true member of the Glassmen family. If you happen to come upon us driving down the highway this summer. Be sure to honk. I'll be in the bus with the bright blue light on the driver's side, as I will be listening to my Sirius radio to help me get down the road during the summer.